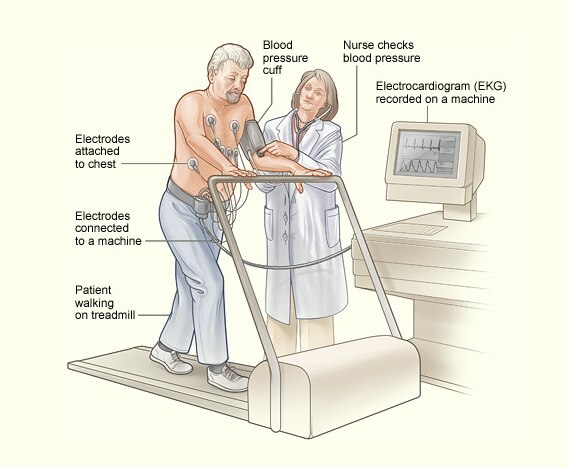 An exercise stress test is performed to investigate chest pain, in relation to heart problems. The results obtained from the test may assist in the diagnosis of condition, planning of future treatment, or in evaluation of what type of physical activities you might engage in with no or low hazards. The test may be stopped at any time due to signs of fatigue or other reasons. A Cardiologist will report to referring doctor within two days. If you have a heart condition, serious potential complications could include an abnormality of heart rhythm, prolonged angina (heart pain), heart attack and a very small risk of death.